You are currently browsing articles tagged Monastic. Congratulations to Professor Roberta Gilchrist on the publication of her new book, Glastonbury Abbey Archaeological Excavations 1904 – 1979! This volume, co-authored with Dr Cheryl Green (an alumni of our department 1992-95), reports on the results of the Glastonbury Abbey Archaeological Archive Project, a collaboration between the University of Reading and the Trustees of Glastonbury Abbey. The project has reassessed and reinterpreted all known archaeological records from the 1908–79 excavations and made the complete dataset available to the public through a digital archive hosted by the Archaeology Data Service. The scope of the project has included the full analysis of the archaeological collections of Glastonbury Abbey by thirty-one leading specialists, including chemical and compositional analysis of glass and metal and petrological analysis of pottery and tile, and a comprehensive geophysical survey conducted by GSB Prospection Ltd. For the first time, it has been possible to achieve a framework of independent dating based on reassessment of the finds and radiocarbon dating of surviving organic material from the 1950s excavations. 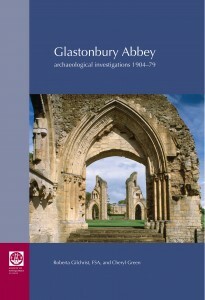 The principal aim of the Glastonbury Abbey Archaeological Project was to set aside previous assumptions based on the historical and legendary traditions and to provide a rigorous reassessment of the archive of antiquarian excavations. This research has revealed that some of the best known archaeological ‘facts’ about Glastonbury are themselves myths perpetuated by the abbey’s excavators. Reassessment of the archive of excavations has identified a number of new questions for future research. The presence of LRA1 pottery confirms occupation at Glastonbury in the fifth or sixth century, but there is no evidence yet to suggest whether this was a religious community or a high status secular settlement engaged in long-distance trade. The relationship of the monastery to earlier settlement patterns deserves further consideration; for example, it is possible that the monastic vallum incorporates a defensive bank and ditch pre-dating the monastery. A striking feature of the finds assemblage is the lack of evidence for metal objects dating to the Middle and Late Saxon periods. The paucity of evidence dating from the seventh to the ninth centuries prompts the question of whether the early monastic core has actually been located. It is feasible that the main domestic buildings of the Middle Saxon monastery were situated to the north of the church, in an area yet to be examined. Fresh excavations will be required to fully understand the character, form and dating of the Ango-Saxon monastery at Glastonbury.